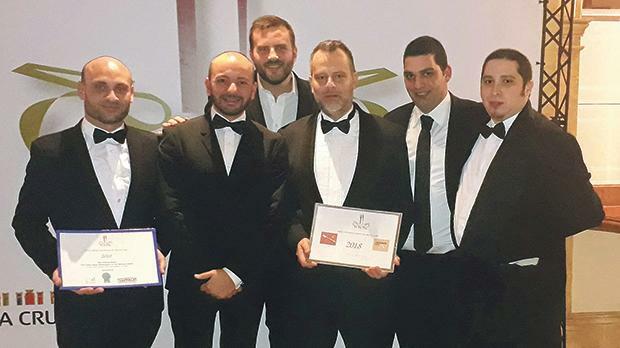 From left: Mark Zammit, food and beverage manager; James Galea, operations manager; Marc Bianco, Temptasian manager; Joseph Xuereb, executive chef; Samuel Sciberras, sous chef; and Marcello Vella, Temptasian head chef. Temptasian restaurant at The Palace hotel in Sliema was confirmed one of Malta’s top restaurants at this year’s edition of the WRMC (Wines and Restaurants of Malta.com) Restaurants Quality Recognition Awards gala dinner and ceremony in St Julian’s. Offering an Asian fusion cuisine with hand-picked chefs from various Asian countries and spectacular views of Sliema and Valletta’s harbour, the restaurant has satisfied the WRMC standards for quality and service and has maintained the Silver Spoon award, thus retaining its status. The recognised restaurants entitled for these awards are those that have been directly surveyed and inspected by the professional survey teams of WRMC. It’s interesting to note that over 120 restaurants were inspected during 2017 and TemptAsian Restaurant, which forms part of AX Hotels portfolio, was one of the successful restaurants. During the WRMC Awards, restaurants are inspected and adjudicated on several facts including atmosphere, cleanliness, cuisine quality, management and service efficiency, attitude towards clients, value for money and other key points.